A historical haven for guaranteed privacy. In the heart of Old Naples, in Vicolo San Gregorio Armeno, lies a veritable institution: the Ferrigno brothers' workshop, which, since opening in 1836, has specialized for five generations in the manufacture of traditional nativity scenes and figurines. So you too can experience this atmosphere of family tradition, Palazzo Caracciolo offers a unique behind the scenes tour of the workshop, where you can admire a display of emblematic characters of the nativity in which no trade is forgotten. 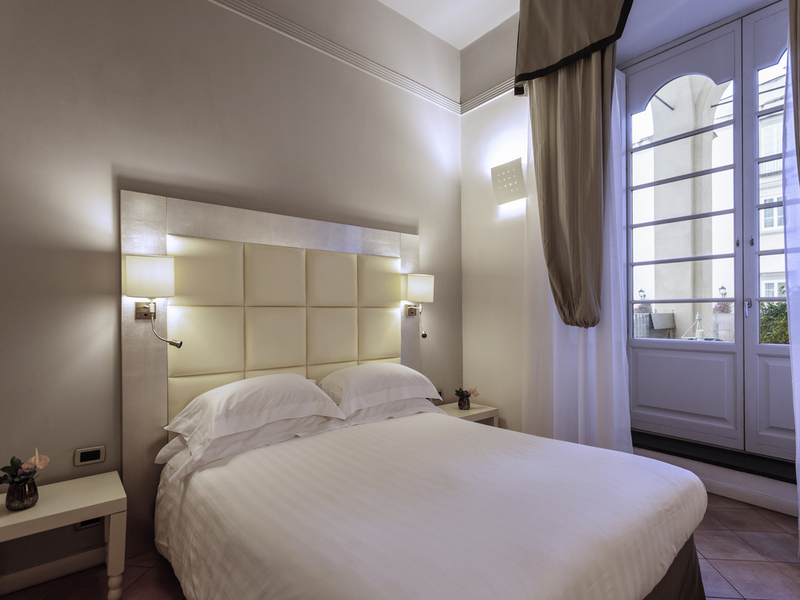 In contrast with the lively city of Naples, Palazzo Caracciolo, with over 800 years of history, is a haven of privacy. The elegant decorations of this charming hotel's 139 rooms perfectly ..
Our fitness and wellness center revitalizes and renews both body and mind. Watch the past come back to life as you walk under the arcades, arches and galleries of the residence. 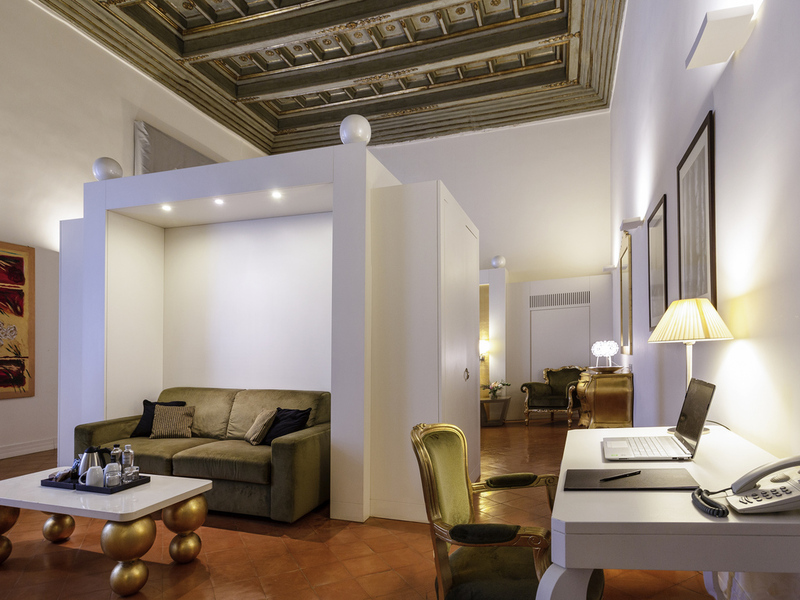 The ceilings that tower as high as 6 meters lend the rooms and suites an air of unrivaled splendor. 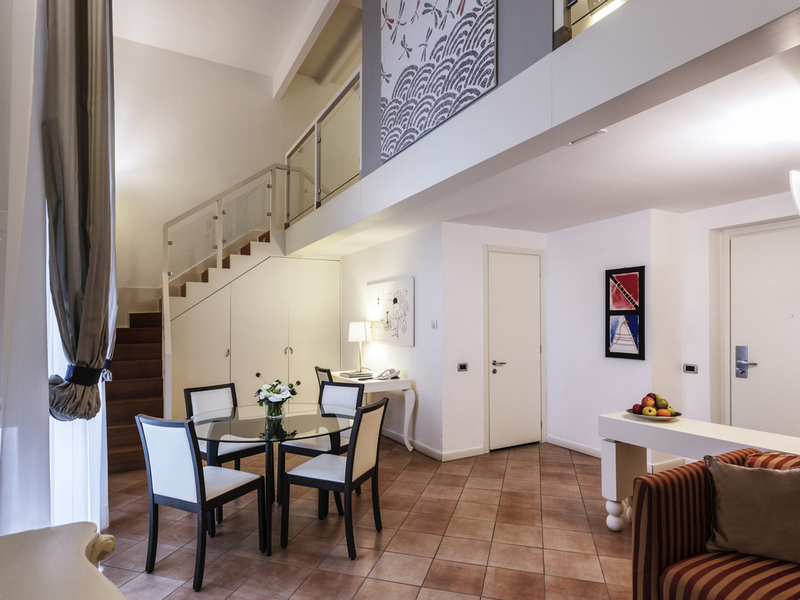 After a hearty breakfast in the hotel, get ready to discover the surprises in store in the heart of Naples. Uncover the city's hidden monuments and unusual flavors. Discover the city of Naples on an exclusive 3-hour guided walking tour with a local expert. From the A1 (E45) highway, follow signs for Napoli Centro and Porto. Take the Napoli Centro exit and follow signs for Stazione Centrale. On the subway, take line two and exit at Piazza Cavour. From the Stazione Centrale train station, take subway line two and exit at Piazza Cavour. 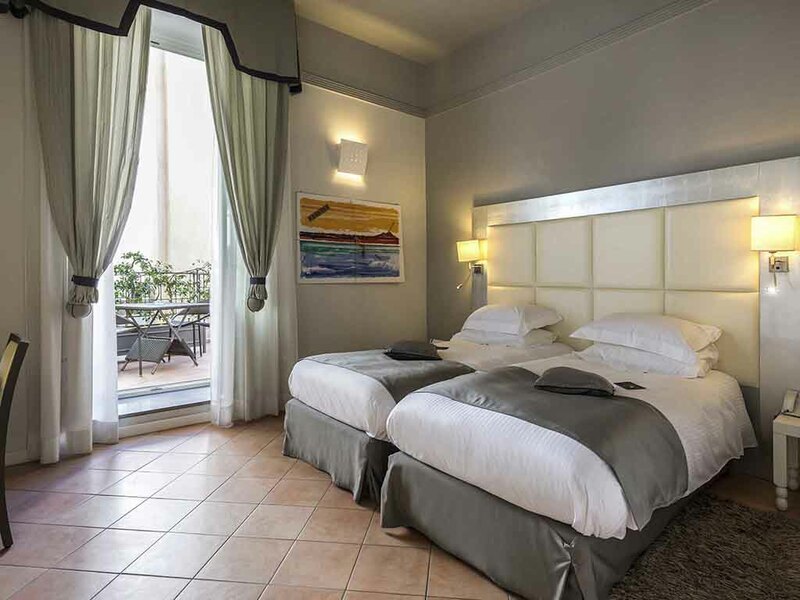 From the airport, take the Alibus shuttle to the Stazione Centrale train station then take subway line two, exit at Piazza Cavour and then take bus number 203. In a warm and informal environment steeped in history, the restaurant services local and traditional dishes boasting authentic Mediterranean flavors and savoir-faire. At the heart of the hotel, La Cantina bar welcomes you in an intimate and cozy atmosphere, offering a wide selection of drinks throughout the day. Chef Daniele Riccardi reinvents traditional Neapolitan cuisine with skill and flair. Our wine bar is the ideal place to enjoy coffee, a sweet treat or local vintage wines. At the Nel Chiostro restaurant, sample a sumptuous menu in an enclosed cloister with elegant windows. All meeting rooms are inside the hotel apart from the Museo Diocesano, which is 328 yds (300 m) away. 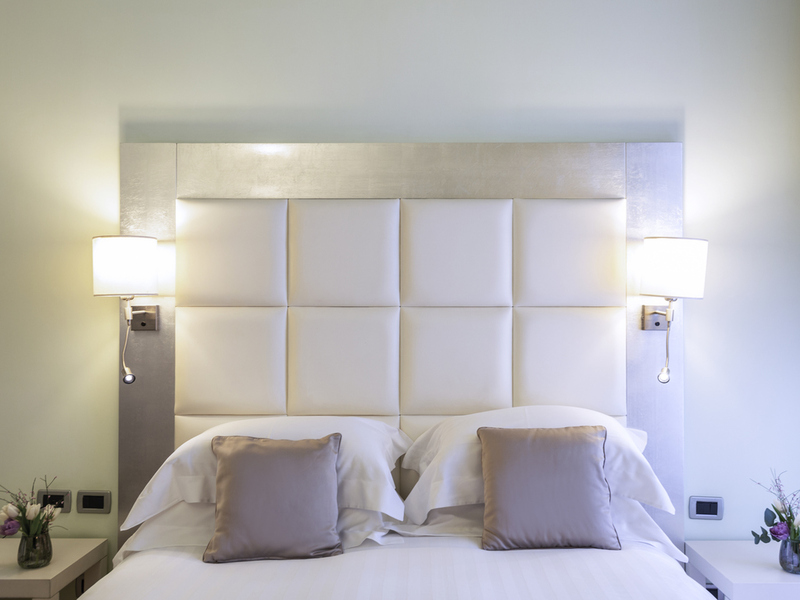 When you book your reception at Palazzo Caracciolo, as a wedding gift we will give you the first night of your honeymoon for free. You can then relax and enjoy the luxurious suite, and take advantage of the free access to our fitness and wellness center. Discover the sights, sounds and history of the City of Sun in the total comfort and safety of a chauffeur-driven vehicle. For more information or to book a limousine, contact the concierge. The fitness area includes treadmills, stationary bikes, weights area with adjustable dumbbells, multifunctional exercise benches and elliptical bikes. Fitness area open 24 hours a day, 7 days a week, with complimentary access for all hotel guests.